What makes addictive games addictive? They tend to be games that you can play quickly with easy controls but it’s still surprisingly difficult to get a high score. We’ve seen a slew of great addictive games over the years and they always seem to come out of nowhere. Let’s take a look at one of the most addictive game for Android right now. 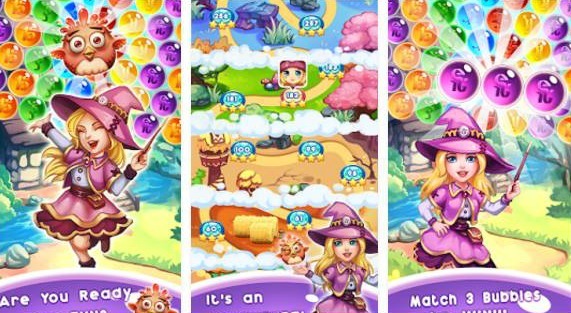 Panda Witch Pop Bubble Shooter is the name of the game we’re talking about, one of the most entertaining games currently on the market. It is created by the developers Bubble Shooter Legend and only requires phones and tablets with Android 2.3.3 and up. With stunning design and engaging sounds and sound effects, this is one of those games that can quickly get under your skin. The goal of Panda Witch Pop is simple – you have to aim right, match at least three bubbles with same color and pop them. This way you will be rescuing the cute little birds which are kidnapped and taken to the bubble farm by the evil baboon. Isn’t that an amazing storyline? You will be playing through many challenging levels, more than 150 to be precise, and that’s not all. The developers will keep adding more levels every three weeks. They even integrated blaze boosters for whenever you need help in your gameplay. If you like to have fun for hours and spend your free time in a better way, download Panda Witch Pop Bubble Shooter for free from Google Play by clicking the link below.